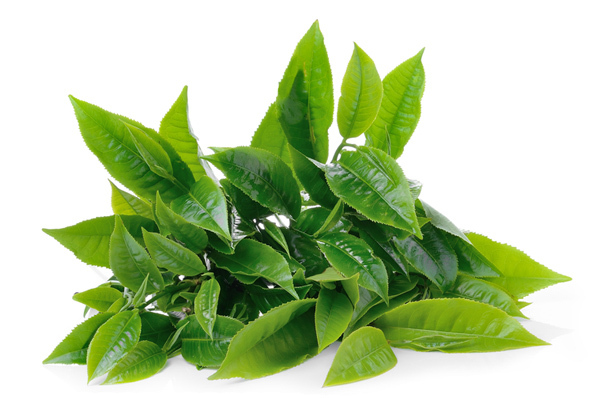 One of the most popular beverages drank throughout the world, green tea, made from the leaves of the Camellia sinensis plant, boasts of countless health benefits with ample scientific research to back them up. Classified based on how the tea leaves are processed, common varieties include gunpowder, matcha, gyokuro, sencha and genmaicha. It is also used for preparing kombucha tea. All varieties are gluten-free. Green tea, the oldest plant-based variety of tea, originated from China, where it has been used for curing various digestive and other health issues for over 4,000 years. Legends say the tea was brewed for the first time during the rule of Emperor Shennong, in 2737 BC. Its therapeutic uses reached the other regions of Asia as well, including countries like India, Japan, and Indonesia. The tea has been mentioned for its medicinal uses in the works of tea Saint Lu Yu, with the book “Tea Classic” claiming a special mention in its history. Zen priest Eisai also wrote about the plant’s appearance, growing methods, uses, and its effects on human body. As found in a research by The Journal of Food Science, the amount of caffeine in green tea can vary considerably, depending on the brand used, and the duration of brewing. Decaffeinated green tea has gained widespread popularity throughout the world as it offers all the goodness of the beverage, without the negative effects of caffeine. A fresh cup of sugar-free green tea contains no calories. 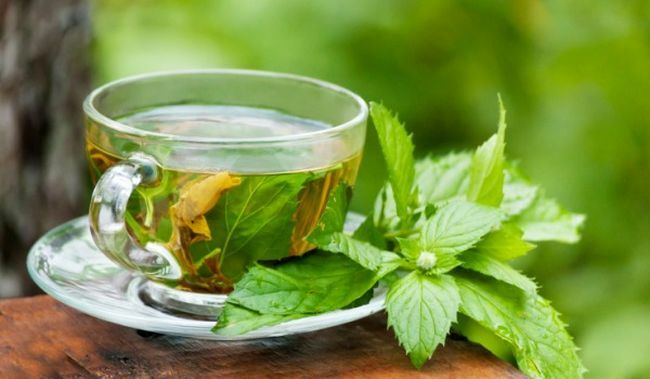 It is often associated with a faster burning of belly fat as the catechins (water-soluble polyphenols) in the tea boost metabolism, promoting the breaking up of fat cells, also speeding up their burning by the liver. They also help control glucose uptake into fat cells, preventing blood sugar levels from rising too high, thus making you feel full for longer after a meal. Due to these reasons, it is often recommended to drink green tea after meals. Studies have shown it to help with losing and maintaining body weight in obese people. Regular consumption of the tea may further promote fat burning when combined with daily exercise. Having a cup of tea before your workout session may be beneficial as a metabolism stimulant. Studies have shown drinking green tea every day reduces and prevents acne. The catechins present in green tea include epigallocatenin-3 gallate or EGCG, epigallocatechin, and epicatechin gallate. Along with the g-linolenic acid, a kind of fatty acid, EGCG contributes in reducing sebum production by skin, thus helping with acne and scars. The catechins also protect skin cells from damage from free radicals, while the anti-bacterial properties of the tea fight against the bacteria responsible for the problem. It is known to maintain the hormonal balance as well, preventing hormonal acne. Studies have shown EGCG to lend the tea with strong anti-fungal properties, helping with skin conditions like candida. In fact, regular intake of green tea may allow the administration of lower doses of antimycotics, while offering better protection from C. albicans, the candida causing fungus. According to a study published by the Dermatology Department at the Case Western Reserve University, Cleveland, the strong antioxidant properties of the tea are primarily responsible for its anti-aging effects. It helps in delaying aging, reducing fine lines, dark spots, and wrinkles, while improving the elasticity of skin, also protecting from sun damage. 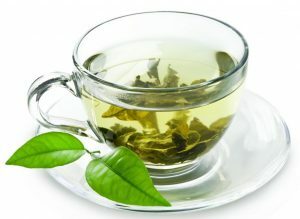 Green tea contains the highest amount of polyphenols, a powerful antioxidant, as it only consists of unfermented leaves. Polyphenols are beneficial for counteracting the harmful effects of free radicals which accelerate aging. The antioxidant and astringent properties of the tea rejuvenates your skin, helps with the shrinking of blood vessels around the eyes, thus reducing swelling and puffiness in those areas. Its vitamin K content makes it beneficial for dark circles as well. Apart from antioxidants, the vitamins A, C, and E, manganese, chromium and zinc present in it makes it highly beneficial for overall skin health. Studies have shown EGCG to relax the arteries and promote smoother blood flow, which might help in monitoring blood pressure, preventing blood clotting, and reducing the risks of conditions like heart attack, stroke, and cerebral thrombus. The catechins are also believed to help lower the LDL or bad cholesterol levels. According to a study done by the National Cheng Kung University, Taiwan, daily consumption of green tea may decrease the risk of developing high blood pressure by around 50%. 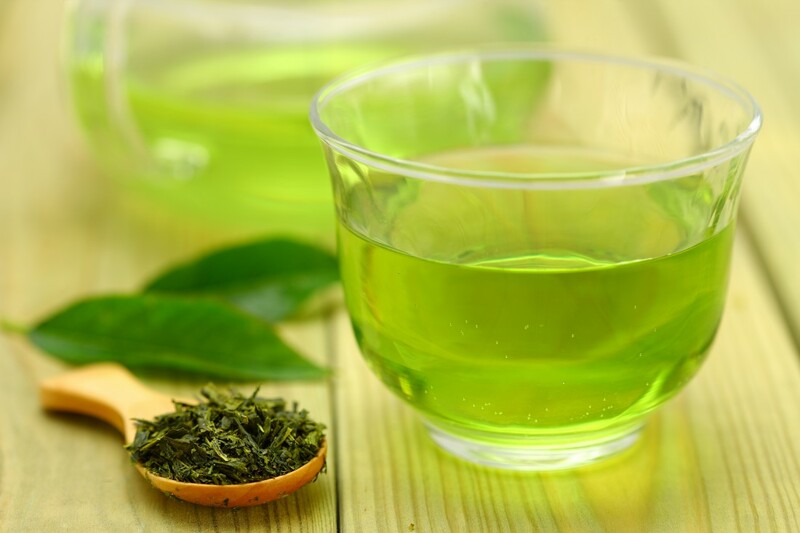 Some study reviews have also found possible evidence of the positive effects of green tea on cholesterol levels; however, more research is necessary. The tea is contraindicated for those on BP medication, especially monoamine oxidase inhibitors (MOIs), and beta-blockers. Since it promotes the functioning of the metabolic system, helping fight obesity, it might also be beneficial for reducing the risk of diabetes. Also, as EGCG relaxes and widens the arteries, reducing oxidative stress, thus lowering blood sugar levels. One Japanese study showed that drinking 6 cups of green tea per day lowered the chances of developing type 2 diabetes by 33%. Various population-based studies have suggested a positive effect of green tea on cancer prevention. For example, various types of cancers have a lower prevalence in countries like Japan, where green tea is regularly consumed. The catechins in green tea are believed to prevent the growth of cancer cells, eventually killing them. Bladder Cancer: It was shown in a research that women who drank tea (powdered green or black) regularly had lesser risk of developing bladder cancer than those who did not. Another follow-up research done by the same researchers revealed that green tea helped men with bladder cancer to have better survival rates. Breast Cancer: Test tube and animal studies have suggested a possible beneficial effect of polyphenols on breast cancer cells. One study done with 472 women showed the spread of cancer to be the least in those with the highest consumption of green tea. The result was most clear on postmenopausal women at an early stage of the cancer. Another population-based study done with Chinese women suggested it to suppress the function of estrogen hormone, which may play a role in breast cancer prevention. Drinking green tea regularly, even before being diagnosed with breast cancer, is also associated with lower chances of recurrence. However, the tea shows negligible effects on those at later stages of the cancer and more evidence is required to confirm the claims. Skin Cancer: The anti-inflammatory and anti-cancer properties of EGCG may be effective in fighting the development of tumor on skin. 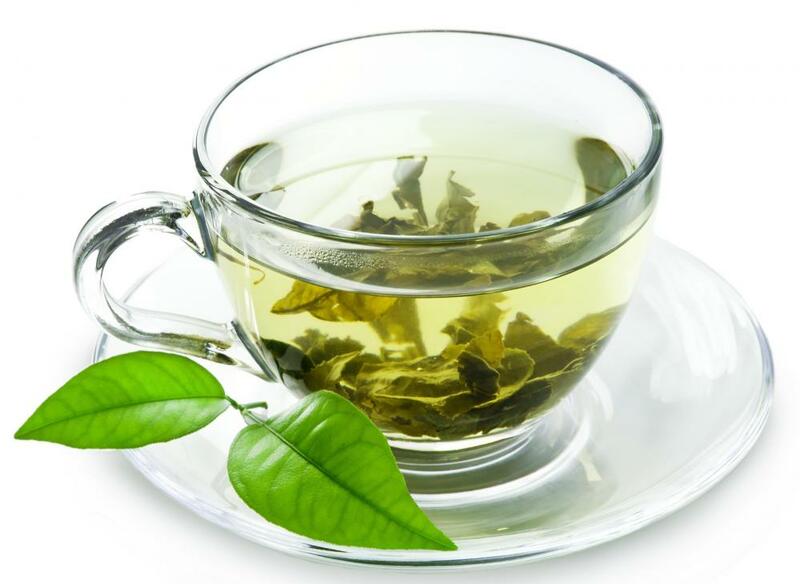 Prostate Cancer: Catechins in green tea extracts have been found to kill the cancerous cells in test tube studies. 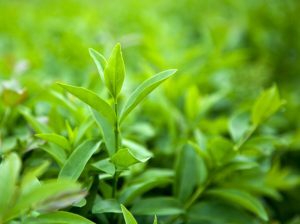 One research done with a large group of people in Southeast China showed a lesser risk of developing prostate cancer with regular green tea consumption. Esophageal Cancer: Animal studies have shown positive results, with the polyphenols content inhibiting the growth of throat cancer cells, human studies render conflicting evidence. Lung Cancer: Although test tube researches have shown positive results on human cancer cells, subsequent studies have presented contradictory evidence. Colon Cancer: Some studies associate daily green tea consumption with a lower risk of colon cancer, while others show an increased risk of developing the condition. The caffeine content in green tea is believed to make it a natural diuretic, stimulating urination to flush out toxins and excess fluids from the body. Animal studies show the tea to boost the diuretic activities of the body, especially when taken in combination with diuretic drugs like hydrochlorothiazide. However, drinking too much green tea may lead to dehydration. Its strong antioxidant properties also help with the purpose, contributing in keeping the liver healthy. Despite little scientific evidence in this field, drinking a hot cup of tea is believed to prevent or reduce cough and cold, as catechins contribute to strengthening the immune system, boosting the body’s ability to fight flu symptoms. The antibacterial properties of green tea also make it a possible remedy for a sore throat. 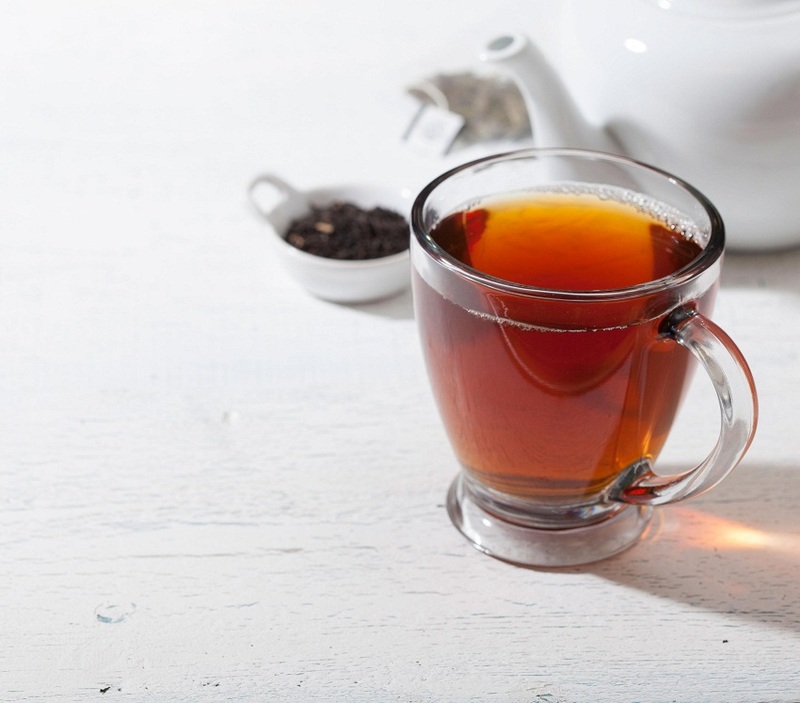 The tea has long been used for curing migraine headaches, with recent scientific studies claiming caffeine to have headache-relieving properties. It is also considered good for treating tension headaches. 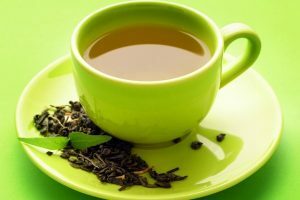 Drinking a cup of decaffeinated green tea may help you sleep better as it contains L-theanine, a unique amino acid found in teas, having calming effects on the human nervous system. However, the regular caffeinated green tea may actually lead to sleeping difficulties due to the caffeine content, so it should never be taken before going to sleep. The “American Journal of Respiratory and Critical Care Medicine” by the American Thoracic Society published one study that showed its powerful antioxidant properties to make it beneficial for fighting problems like sleep apnea. Green tea polyphenols (GTP) and antioxidants fight the negative effects of free radicals, preventing oxidative stress and cell damage in the brain. According to animal studies, GTPs may be effective in protecting the brain and nervous system from various neurodegenerative changes, lowering the chances of developing conditions like Alzheimer’s and Parkinson’s. 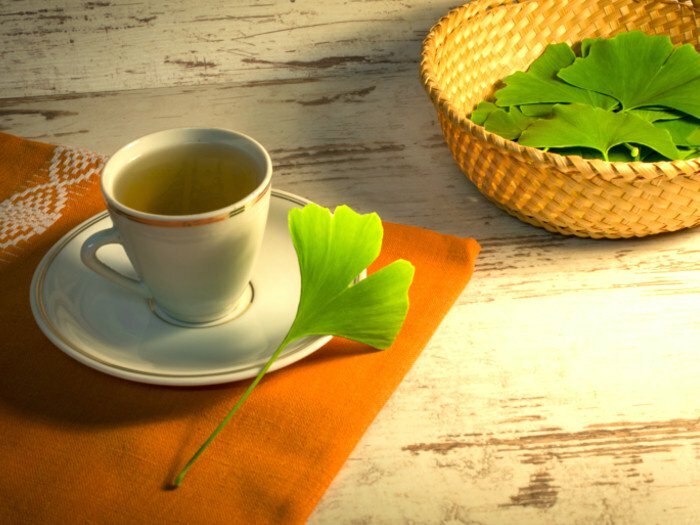 The amino acid called theanine present in the tea provides relaxing effects, helping with stress, anxiety, and depression. Mineral, especially calcium, accumulation in the body is the leading cause of kidney stone formation. 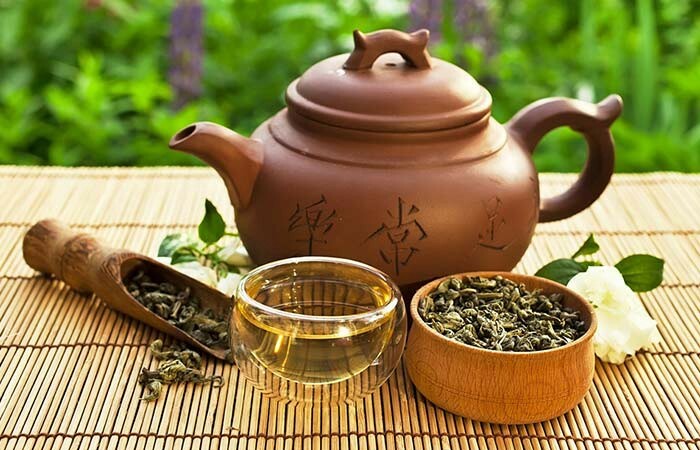 A Sichuan University (Chengdu, China) study, published in the journal CrystEngComm, found green tea extracts to bind with calcium oxalate, creating crystals of a different shape, preventing them from clodding together to form larger stones. The rich antioxidant, vitamin and mineral contents of green tea make it possibly beneficial for boosting the digestive system, helping it function properly. As a result, it may also be good for problems like nausea, gas, bloating, constipation and diarrhea. Studies have also suggested green tea to promote good bacteria in the intestines, further contributing to smoother bowel movements. However, contrary to the common concept, green tea does not work as a natural laxative. The tea may also help with acid reflux, heartburn, and GERD, by keeping the digestive acids and foods from moving into the esophagus. Its anti-inflammatory properties may be good for relieving heartburn and discomfort caused by reflux as well. Researches show green tea to be potentially useful for different inflammatory bowel diseases (IBD), like Crohn’s disease and ulcerative colitis. The University of Cincinnati College of Medicine research findings show EGCG to be effective in disrupting the signaling pathways that eventually leads to inflammation of the colon, causing ulcerative colitis. Drinking green tea regularly is believed to be beneficial for your overall oral health, as its antibacterial, and antimicrobial properties protect you from cavity, dental plaque, and bad breath by killing the responsible bacteria and other microbes. Its fluoride content is also believed to be advantageous for the teeth. 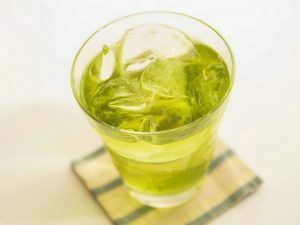 Various researches have been carried out to confirm the oral benefits of green tea, with considerable favorable results. A Japanese study suggested its anti-inflammatory properties to be possibly useful for protecting the gums, and managing various periodontal diseases. The rich flavonoid content is beneficial for promoting overall bone health, while its anti-inflammatory properties help with relieving joint pain and inflammation associated with arthritis, slowing down cartilage breakdown. One study, done with endurance athletes, showed drinking 4 cups of green tea per day for 12 weeks to increase the overall energy and endurance of the subjects. The energy boosting properties of the tea may be attributed to its caffeine content, in addition to the presence of other alkaloids including theobromine, and theophylline. Not only do the antioxidants promote your hair growth, the 5-alpha-reductase inhibiting properties in green tea catechins help in blocking the functions of dihydrotestosterone (DHT) hormone, one of the primary factors causing hair loss. Drinking 2-3 cups every day is believed to be beneficial to get thick, strong hair. It is often claimed to help with fertility in both men and women, by improving the functioning of various hormones, with many believing it to increase the testosterone levels as well. However, there is little evidence to support these effects. Green tea is also believed to help in some other conditions including polycystic ovary syndrome (PCOS), as well as bacterial infections like E. coli and H. pylori. Green tea leaves are mixed with honey, and lemon to be used as a face mask as the antioxidants in the leaves help to flush out toxins from the skin, reducing scars and blemishes, improving complexion while moisturizing and improving the elasticity of skin, preventing signs of aging. The tea is applied directly to the skin as a toner for all skin types, as well as to fight acne and scars. Used tea leaves are also mixed with granular sugar for making a face scrub. Used green tea bags are placed over the eyes for their antioxidant and astringent properties that help to get rid of dark circles, and under-eye puffiness. Brewed tea is used as a hair rinse to boost hair growth, while also fight issues like hair fall, dandruff, and dry scalp. The tea is used as an enema to relieve constipation. It is used for gargling to treat cough, cold and sore throat. Ointments with green tea extracts are topically applied to treat genital warts. Cold brewed tea is used as an antibacterial oral rinse, with studies showing it to be equally effective as chlorhexidine mouthwash. Take one cup of water in a saucepan and heat it. Make sure it does not come to boil. 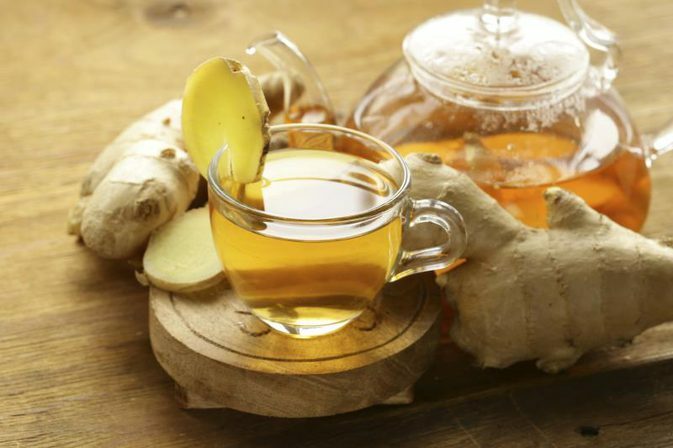 You can also add some ginger to the water along with the tea leaves to brew a cup of ginger green tea while adding a dash of lemon juice gives you a refreshing cup of lemon green tea. Research has shown adding lemon juice to green tea to increase its cancer-fighting properties, as vitamin C helps antioxidants to function better. Other herbs like basil, mint, and lavender may be added as well for added rejuvenating properties. To make iced green tea, use two teaspoons of tea leaves for one cup of hot water, adding a cup of chilled water to the tea after it is steeped and strained. Add honey and serve with ice cubes. According to University of Maryland Medical Center (UMMC), drinking 2-3 cups per day provides you with 240mg-320mg of the beneficial polyphenols, depending on the brand and type of the tea. The decaffeinated form is usually recommended, and can be taken at any time of the day. Otherwise, stay away from it in the evening, especially if you are sensitive to caffeine, as it may interfere with your sleep. Consuming over 9-10 cups a day may lead to various adverse health effects due to the high caffeine intake. It does not usually have any negative health effects when taken as part of a normal diet; however, its caffeine and tannin contents may lead to certain problems in case of overconsumption. Allergy Symptoms: Some people may experience allergy symptoms like nausea, dizziness, stomach ache, upset stomach, diarrhea, and sleeping problems. 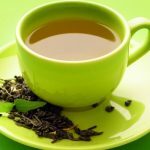 Green Tea and GERD: A Japanese study suggested a connection between drinking green tea and developing GERD (gastroesophageal reflux disease). The exact reason behind this association is still not clear, but the acidic properties of the tea may be responsible. People who experience excessive acidity or heartburn after drinking the tea are recommended to stay away from it. Disrupted Thyroid Function: One 2011 study showed drinking more than 5 cups a day may increase the risk of thyroid cancer in premenopausal women. It is also not recommended for those on thyroid medication as it may lower the T3 and T4 hormone levels. Does Green Tea Stain Teeth: The tannins in it have acidic properties that break down your tooth enamel, making it easier for pigmented molecules to attach to them, leading to stained teeth. If taken along with stimulant drugs such as amphetamines, it may lead to dangerously high blood pressure and rapid heartbeat. It should also not be taken with blood-thinning medications like Coumadin (warfarin). One or two cups of the decaffeinated tea are considered safe for pregnant women. However, taking over 2 cups of the regular caffeinated tea during the time of conception may increase the risk of neural tube defects in the baby by interfering with your body’ ability to absorb folic acid. Higher chances of having a miscarriage are also associated with it. Having regular green tea in moderate amounts does not usually cause any problems. Overconsumption may be a problem though, as the caffeine may pass into the baby’s body through breast milk. Organic green tea is available in loose leaf as well as tea bag form, while you can also go for flavored varieties like jasmine, lavender, ginseng, and cinnamon teas. 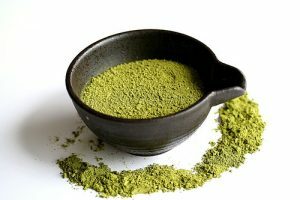 Different types, like matcha tea, oolong tea, gunpowder tea, and green tea powder are also available both online and from local departmental and herbal tea stores.